Porcelain dental restorations are a far cry from the wooden teeth of old. 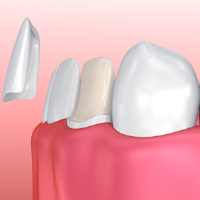 Over the years, porcelain has become an essential material in cosmetic dentistry. It affords both dentist and patient with many benefits. Patients love their porcelain restorations, and dentists love the ease of construction and high rate of patient satisfaction. Keep reading to learn why porcelain is the material of choice in cosmetic dentistry. When patients want to preserve a natural, healthy smile, they choose porcelain. Porcelain is unique in its semi-translucent nature, which gives it the ability to reflect light just as natural enamel does. To fit in a smile, porcelain restorations must be fired and milled- and during this process, the customization options are endless. A skilled dentist can attain a near-perfect shade match. Porcelain restorations are more durable than they’re given credit for. The field of cosmetic dentistry has relied on porcelain as the cornerstone material of restorations for years because time and time again, it proves it’s worth through long-lasting, beautiful restorations. Normal wear and tear shouldn’t cause damage to a porcelain restoration. Porcelain is about as durable as natural teeth- which, surprisingly, can chip during normative use if not mindful of its fragility. Biting onto utensils, bumping teeth with ceramic cups, and aggressive chewing can all cause damage over time. Advancements in the field of cosmetic dentistry have afforded us a stronger, more effective porcelain than was available in decades past. New research and technologies have improved upon source material and firing methods. For example, the pressed ceramics used today are much more durable than they once were. Broken and chipped crowns are a myth that must be dispelled to forward the industry of cosmetic dentistry. Dr. Mike Asay at Chisholm Trail Dental Health completes a majority of his cosmetic restorations using fine porcelain or zirconia. Cosmetic services from our Round Rock, TX dental practice are as beautiful as they are stable. Visit us and experience the difference yourself. We look forward to helping you smile!